Naples Reserve’s sought-after location, casually awe-some lifestyle and variety of home designs appeal to all – from snowbirds and the newly retired, to families and young professionals. Hailing from New Jersey, and most recently from Connecticut, Adam and Allison Recla – both in their early 40s – had vacationed in Marco Island for years. Last year, the irresistible appeal of Southwest Florida’s climate beckoned them to a more permanent arrangement. They moved into their Naples Reserve home just two days before Christmas. “We didn’t like winter!” said Allison. The couple’s 14-year-old son and two daughters, ages 11 and 8, were up for the move south as well. They looked forward to enjoying family time in their pool year-round. Sailing and kayaking in Eagle Lake has become a favorite pastime for their kids, and Allison and Adam use the fitness center regularly – they’ve even taken Tango and Zumba classes. “Our family enjoys biking around the community on the wide and beautifully landscaped sidewalk,” said Adam. “Everyone has been great here – it’s a happy and friendly community,” said Allison. Felipe and Cristina Duran, both 37, moved to Naples Reserve last spring after the company Felipe currently works for was expanding its presence. 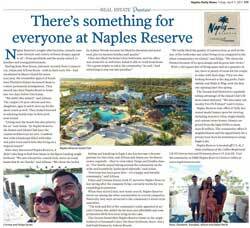 When they started their new home search, Naples Reserve stood out among the other communities in several categories. Naturally, they were attracted to the community’s resort-style amenities. “The look and feel of the community really appealed to us,” said Cristina. She added the lot sizes and affordable and comprehensive HOA fees were icing on the cake. The Durans found their Naples Reserve home in the neighborhood of Savannah Lakes: the three-bedroom, three- and a half-bath Patmos by Ashton Woods. “We really liked the quality of construction, as well as the size of the bedrooms and other living areas compared to the other communities we visited,” said Felipe. “We chose the Patmos because of its open design and its great lake views.” With 2,542 square feet of living space and an expansive lanai, there is plenty of room for the couple to relax with their dogs. They are also looking forward to the dog parks, Paws Awhile and Walk & Wag, with the first one opening later this spring. The Durans find themselves regularly taking advantage of the Island Club’s fitness center and pool. “We also enjoy our weekly Fire Pit Fridays!” said Cristina. Naples Reserve now offers 17 fully decorated model homes open for viewing, including attached villas, single-family and custom estate homes. Homes are priced from the high-$200s to more than $1 million. The community offers 11 neighborhoods and the opportunity for a private boat dock for homebuyers along Eagle Lake.